Check-in to this campsite in Kasol and spend the night in tents pitched under the starry night skies of Himachal Pradesh. You can head out to explore the charming and rustic town of Kasol, visit the quirky cafes serving Israeli cuisine, stroll down the mysterious and narrow bylanes of the town or take a dip in the relaxing waters of the Parvati River. In the evening, you can return to the campsite and retreat into your tents after a day spent exploring the outdoors. This campsite stay in Kasol is perfect for travellers on a budget who want a simple, no-frills option for accommodation in Kasol. A minimum of 2 travellers are required to book this trip. Located just 10-min walk away from the Kasol bus station, this campsite is great for travellers who wish to stay close to the town of Kasol. The tents are pitched on a mountain-side, peppered with pine trees, bringing you closer to nature in Kasol. 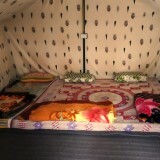 Your tents will be equipped with comfortable bedding, pillows and blankets. The campsite is attached to a hotel property, allowing it to serve fresh and delicious meals to all campers at the common dining area. The campsite is also equipped with a common washroom. • Go camping in Kasol and spend the night in tents. • Get high on nature in the gorgeous town of Kasol. • Stay at a picturesque campsite with pine trees all around. For cancellations made on or less than 15 days before check-in date of the Kasol camping trip: no refund. Bookings for children younger than 5 years are not charged. Bookings for children between the ages of 5-12 are charged at a discounted rate of INR 500 per person. Bookings for children older than 12 years are charge at full price. The tour operator reserves the right to change or cancel the itinerary of this Kasol camping trip due to bad weather conditions or other unforeseen circumstances to ensure maximum safety of travellers and staff. Travellers are required to bear any additional costs arising due to such a change in itinerary. Day 1 of camping in Kasol: Check-in and enjoy! Arrive at the campsite and check-in to your tents by 12:00 hrs. You can spend the rest of the day at leisure. Head out to explore the town of Kasol and visit the local marketplaces, narrow lanes or quirky cafes and restaurants of the town. Walk down to the Parvati River that flows right besides the town and watch the gorgeous river flowing through Kasol. Alternatively, you can also spend the relaxing in your tents at the campsite. 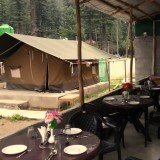 Overnight in tents at the Kasol campsite. Wake up in the morning, you'll check out by 11:00 hrs. Depending on availability, you can also extend your stay at the campsite. Your trip ends here. 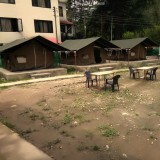 Overnight in tents at the Kasol campsite. Check-in time at the campsite is 12:00 hrs. 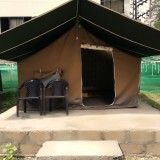 You'll be accommodated in tents on twin-sharing basis. 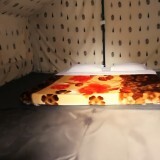 The tents will be equipped with comfortable beds, blankets and pillows. The campsite includes a common washroom. 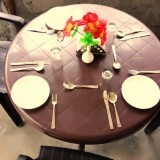 Today's meal package includes dinner only. 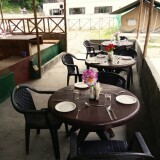 You may visit any of the restaurants in Kasol to have meals at your own expense. Kasol is well-connected to most major cities of the country via frequent buses to the Kasol bus station. Alternatively, you can also board a flight to the Kullu-Manali Airport and travel to the campsite in a private cab/taxi. 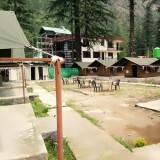 The campsite is located 5-min drive away from Kasol bus station and 1-hr drive away from the Kullu-Manali Airport.